Every single time I have made this for guests, someone has said, "This is the best salsa and/or guacamole I have ever had!" When my father-in-law made this comment, I told him I got the recipe from the son of a lady who lived near him. I had heard that she is an amazing cook. He knew immediately who I was talking about. Thank you to Janet Athay for allowing me to post this. You'll wish you could thank her too! 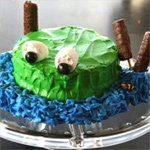 Make this with Janet's guacamole! Seed the jalepeno(s). Chop each into eighths. Peel and quarter the garlic cloves. Place both of these plus the salt in a food processor. Process into a paste wiping the sides down as you go. Pour into a medium bowl. 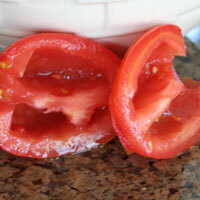 Cut the top out of the tomatoes. 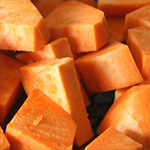 Slice them in half and gently squeeze or spoon out the seeds. This step is optional, but I prefer a thicker salsa. Without a food processor dice the tomatoes very small. 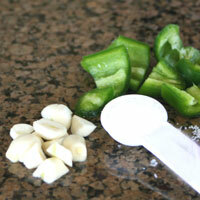 For the garlic and jalapenos use a garlic press or mince them. Do everything else the same. 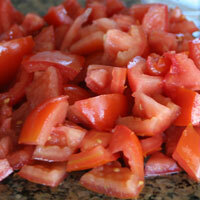 Chop each tomato into eights. Add to the food processor working in three batches. If they are all added at once, the ones on the bottom get over-processed and the top doesn’t get processed enough. Pulse them 6-8 times for one second each time. Add to the jalapeno mixture. Small dice and add the onion. Chop or mince the cilantro and add. 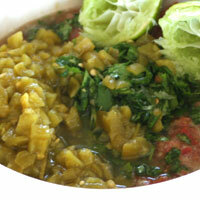 Add the sugar and green chilies. Squeeze in the lime juice. Mix and add more lime juice and salt to taste. The salsa is ready at this point, or you can take a hand blender and pulse it a few times to chop any large bits of tomato and onion. 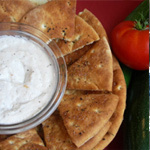 Differences in fresh vegetables: Recipes like this can be tricky because every tomato, jalapeno, garlic clove, etc, are different. Even if we weighed them, each has a slightly different flavor and ripeness. You can get quite consistent results if you roughly use the same size vegetables. 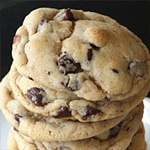 Processing: It is very important to follow the same process each time to replicate the taste. You would notice a difference in taste if you pureed the onion as opposed to chopping it, or minced the garlic as opposed to processing it. 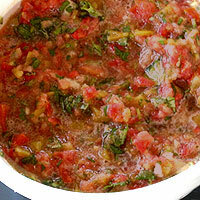 Soupy salsa: Over-processing the tomatoes is probably the easiest thing to do wrong in this recipe. You don't want to end up with soup, so process them carefully. 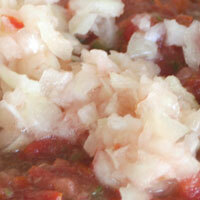 Freshness: The biggest problem with fresh salsa is that it's really only good the day it's made. We still eat it the second day, but wouldn't serve it to guests. 1. Seed the jalepenos. Chop each into eighths. Peel and quarter the garlic cloves. Place both of these plus the salt in a (1)food processor. Process into a paste wiping the sides down as you go. Pour into a medium bowl. 2. Cut the top out of the tomatoes. Slice them in half and gently squeeze or spoon out the seeds. This step is optional, but I prefer a thicker salsa. 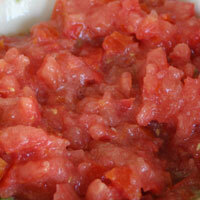 Chop each tomato into eights. Add to the food processor working in three batches. If they are all added at once, the ones on the bottom get over-processed and the top doesn’t get processed enough. Pulse them 6-8 times for one second each time. Add to the jalapeno mixture. 3. Small dice and add the onion. 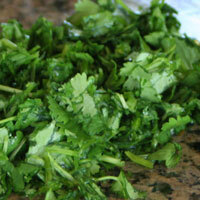 Chop or mince the cilantro and add. Add the sugar and green chilies. Squeeze in the lime juice. Mix and add more (2)lime juice and salt to taste. 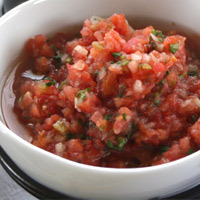 The salsa is ready at this point, or you can use a hand blender and pulse it a few times to chop any large bits of tomato or onion. 1. Without a food processor dice the tomatoes very small. 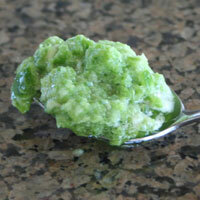 For the garlic and jalapenos use a garlic press or mince them. Do everything else the same.